The "Big Screen" for GPS dog tracker is finally here. The Garmin DriveTrack 71 "mirrors" your Alpha100 or Astro 430 GPS dog tracking device screen to a 6.95 inch high resolution display when you track your dogs in the car. With the bigger and brighter display, you will be able to see your dogs' status much easier. The Drivetrack 71 comes with preloaded Topo lite map which shows multiple dogs' location, status, direction of moving and speed from the outdoor maps or turn by turn City navigation map. It can be also upgraded to the full Topo map and Birds Eye Satellite Imagery with more details. The Garmin DriveTrack 71 "talks" to the Alpha 100 or Astro 430 handheld device via Bluetooth. It means the DriveTrack 71 must within 50 metres range from the Alpha 100 and Astro 430 or it will lose the connection. 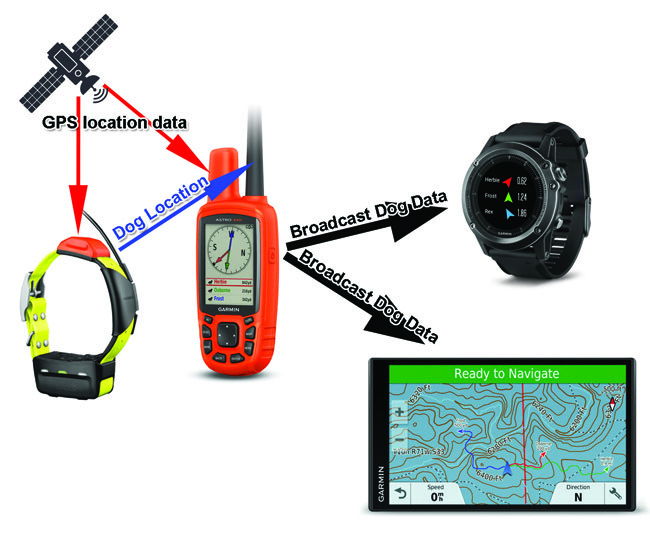 Once the dog collar is connected with the Alpha 100/Astro 430 and receiving GPS signal without problem, the Dog status will be shown on the DriveTrack 71 screen. Please note: The Astro 430 already comes with the latest firmware but Alpha 100 requires firmware upgrade to 7.60 or above to work with Drivetrack 71. It can be updated via Garmin Web Updater software as well as Garmin Express app. With the latest software update, the Broadcast Dog Data menu will come up. It has to set as “on” in the Alpha 100/Astro 430 handheld, otherwise it will display Lost connection on the Drivetrack 71. With the Garmin DriveTrack 71, you can easily track up to 20 dogs on a 6.95 inch screen, pinch to zoom touch screen GPS tablet with up to 2.5 second update rate. The device comes preloaded with Garmin City Navigator Australia and New Zealand Map and Topo Lite AU/NZ outdoor maps which means you can use turn by turn direction GPS tracking in the city or directions only in the field. The DriveTrack 71 connects to smartphones (Apple ISO and Android) via bluetooth (smartphone link app). With the smartphone connection, you can see who is calling, ignore or answer any calls, and speak through the built in speaker, receive texts and alerts from compatible phone apps - facebook, email, twitter etc all on a 6.95 inch HD touch screen. The live traffic update also requires a smartphone connection. Click the button below to add the Garmin DriveTrack 71 GPS Dog Tracker and Car Navigator to your wish list.